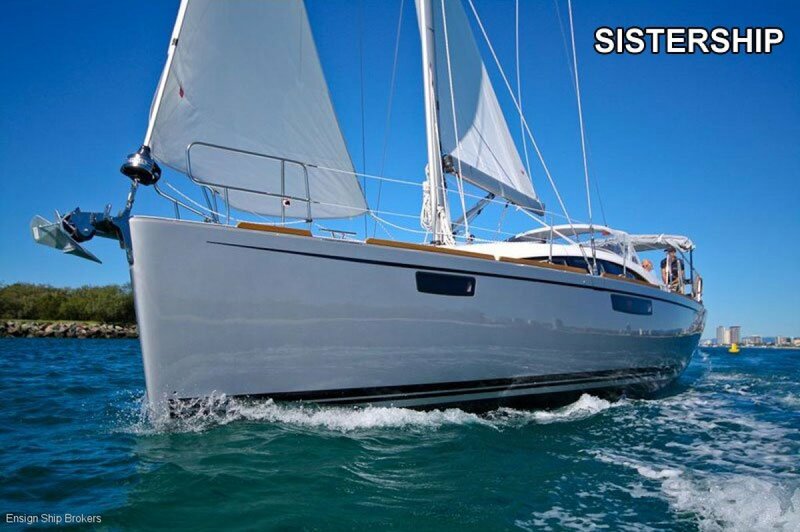 If you are considering a new Bavaria 42 Vision look no further this pre loved late model vessel which presents as new. Still has the scent of a new boat, has never been slept in. "Shanghai" features the popular 2 cabin and 1 head layout, with the upgraded Oak interior and Ocean line flooring. The large owners cabin forward, features an island queen bed allowing easy access from both sides. The saloon is very bright due to an abundance of natural light flooding in through large, tempered glass skylights and opening hatches. The head compartment is huge, featuring a separate shower stall. Aft of the shower, through a full size door, there is a walk-in storage area with access from the cockpit. The 2nd cabin can be set up as two single beds or as a king size bed. The Bavaria 42 Vision has an extraordinary cockpit layout because of the off-set companion way to starboard. This allows for easy walk through access from the swim platform to the saloon even when the cockpit table is set with guests eating dinner on the port side. The Vision series sails exceptionally well and is easily sailed short-handed due to the German mainsheet system with both mainsheet and genoa sheets running to electric winches, strategically mounted adjacent to each helm. This set up allows the rest of your family to simply relax and not be disturbed when altering course and trimming sails. STORAGE: Locker in foreship and aft cabin, Storage space with drawers and flaps.